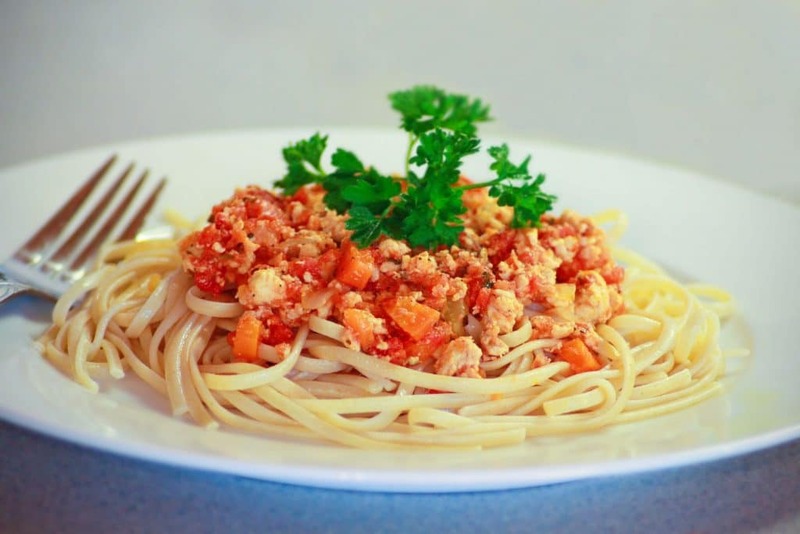 For a healthier and leaner alternative to red meat but still made in authentic Italian fashion, try this Chicken Bolognese. Slow simmered with vegetables, herbs and white wine and finished with fresh basil and heavy cream, this sauce is full of flavor and is sure to become a family favorite. Before we get to the recipe, here are a few tips for making perfect pasta. Sufficient water is key. For a pound of spaghetti, you need at least 5 quarts of water. Using too little water will result in the pasta sticking together during cooking. Bring the water to a boil, then add 1 tablespoon of salt. Adding salt to boiling water obviously helps flavor the pasta, but there is another reason for adding salt: It increasing the boiling temperature capacity so that the pasta can cook faster for optimal texture. Next add the pasta, stirring occasionally to prevent sticking, until al dente. You may need to test a noodle a couple of times. Perfect pasta should be slightly chewy, never mushy. Do not add oil the water, it will keep the sauce from adhering to the pasta. For the same reason, do not rinse the pasta after draining it. This will get rid of the starch, which helps the sauce stick to the pasta. Only rinse pasta if you’re making a cold pasta dish. Serve immediately with the sauce. A healthier and leaner alternative to beef, this Chicken Bolognese is still made in authentic Italian fashion and is sure to become a family favorite. Heat the butter and oil in a large Dutch oven over medium-high heat. Add the onion, carrot and celery and saute until softened, about 5-7 minutes. Add the garlic and cook for another minute. Add the chicken and cook, breaking up the pieces, until there is no pink remaining, about 5 minutes. Add the wine, increase the temperature to high, and boil for 2 minutes. Add the tomatoes and their juice, the chicken stock, parsley, rosemary, and thyme and bring to a boil. Reduce the heat to low and simmer for 1 hour, uncovered, until the sauce has slightly thickened. In the last 10 minutes, add the cream, Parmesan cheese, and basil and season with salt and pepper. 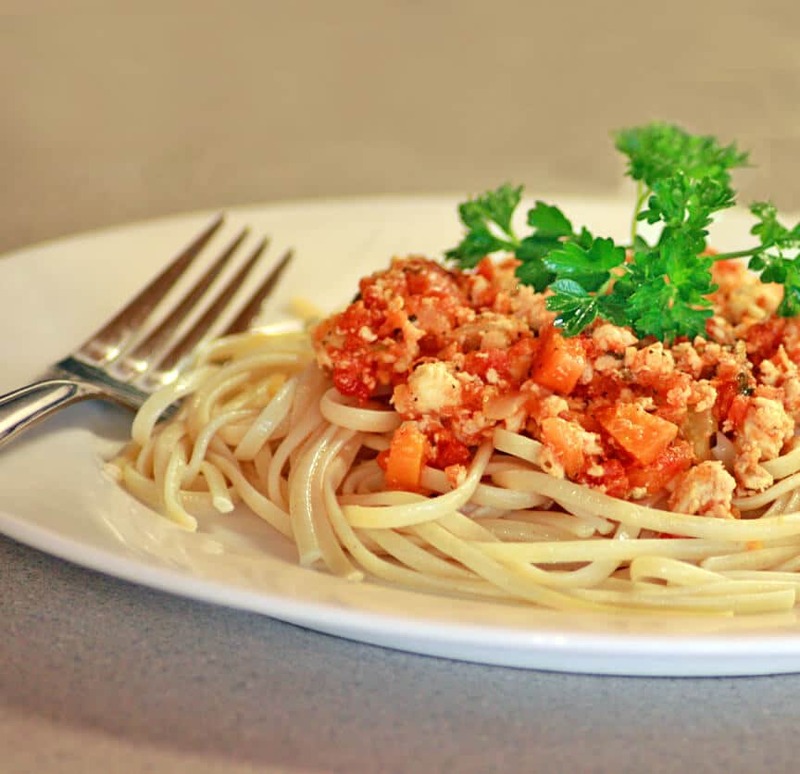 Serve on top of the cooked spaghetti and garnish with Parmesan cheese. Note: This sauce tastes even better the next day. It can be made up to 2 days in advance. It freezes well.